King of Wands (R) says you find yourself frustrated over your lack of achievement which has resulted from your excessive changeability. You are using psychological armor and defenses – afraid to reveal your true self and your real feelings. Take your time in any upcoming agreement before making your final decision. Prepare your mind for change – your lifestyle can be altered now, as changes occur that may turn the tide of affairs. You will experience a strong focus and directional clarity. You have become disturbed by a situation which has had a bad influence on you – your qualities have been altered as your natural energy has encountered obstacles and defeats. You have not lost your force – these experiences have helped you become tempered and more understanding of others. You can now easily recognize the people who are inclined to be intolerant and strict in their manner – the people who could be opposing you. Remain receptive to indications of a disagreement or dispute and be the first to withdraw. Acknowledge when you are feeling uneasy and be sure that all the facts are correct. Accept that you need never allow anyone to be overly aggressive with you. You may now face the dynamic part of your “inner” assertive nature – allow yourself to “feel” your determination and apply your inspired vision without holding back in any way. How are you using your decision-making and leadership abilities? In the first position: Though you are versed with the words, willing in the heart and capable in the body, it will take all of these and more to keep the caravan on the right road. 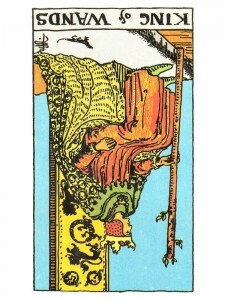 In the second position: At one extreme, this suggests that your past safety nets are not as strong for you at this time. At the other extreme, there may be too much support that you have relied on too heavily for your own independent development. In the third position: Of course you need to heed the messages of this king for your own benefit, but there are others who depend on you for your spiritual knowledge. In the fourth position: Distorted, this otherwise healthy person may become a block instead of a blueprint/foundation for love and creativity. Extremes – the figure is idolized and idealized and real life will find it hard to compete or the figure is loathed and by extension determines that all men or all of a certain type of men are not to be loved or trusted. In the fifth position: You may think adversely about this king or he about you. A subversion of the spiritual dogma or message is possible. In the sixth position: If this is someone already in your life, this may be a test of that relationship. This may represent a disappointment at the formal structure or presentation of a spiritual way. In the seventh position: If this is already someone in your life, this may show a turn of mind between you. In the eighth position: As good and wonderful for others as this person may be, he seems to be adversely affecting your day to day reality. There are mismatches of all kinds on all levels. In the ninth position: Your heart may be involved with this king, but rather not be. Or, the opposite, this can be the symbol of your heart’s sadness over this person. Spiritual betrayal by one’s teacher/mentor can appear here. In the tenth position: Consider carefully accepting this mantle of spiritual leadership for your fellow travelers need you especially at this time.